During Goa tour I read somewhere a brochure talking about Jake The Snake Boat Trips, Backwater Crocodile Dundee and I riding solo Royal Enfield Thunderbird Twinspark to find out the location – Cumbarjua village somewhere near Old Goa â€“ not sure but the only location to watch crocodiles and the ride continues..
Cumbarjua canal flowing and I on top of a bridge. There were no signs of any crocodile watching or location to hire boats. I decided to ask a carpenter working within his shop close to the canal. St. Estevam village â€“ The correct location â€“ said He. Take a U-turn drive till Tonca and ask for St. Estevam village. Ok â€“ said I and the ride continues..
And query about Crocodile watching, Cumbarjua canal. I riding again..
2.5 km journey passing through St. Estevam church (right-side) I again stopped to know about the ferry and luckily I was welcomed by a person conducting/organizing boat trips for watching crocodile and his name is â€“ Jake. I was welcome within his home. Jake home is very close to St. Estevam Ferry Jetty. Upon query Jake shared information about boat trips and about the area. The path I followed to visit St. Estevam village was 15 plus km but the shortest-route is from Gandhi circle, Old Goa only 3.5 km approx. â€“ said Jake. Really??? â€“ said I and we went to watch the shortest distance. During walk he narrated answers as per queries. Cambarjua canal starts from Mandovi river and reaches Zuari river finally merge into Arabian Sea. Daujee ferry â€“ The correct location (3.5 km from Gandhi circle, Old Goa) one has to ask once within Old Goa. Once you are at Daujee ferry you can see this location i.e., St. Estevam ferry where we are standing currently. And you said you organize trip too? Yes â€“ said He. 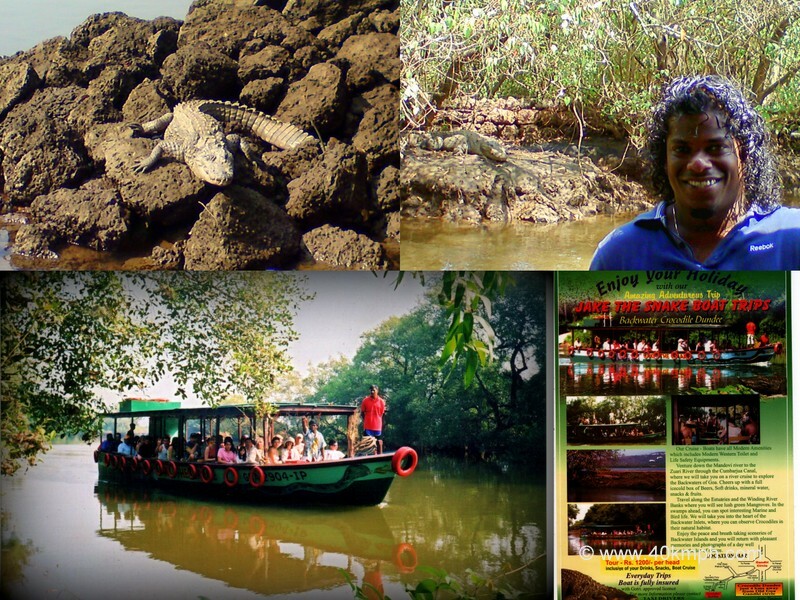 For the last 25 years since father’s days and then for the last 12 years I – Jake organizing boat trips (Government approved) to watch crocodile in natural habitat within Cumbarjua canal. Crocodile in these areas are known as saltwater crocodile/marsh crocodile. Two wooden boats having capacity of 40 passengers each equipped with all safety equipments along with western toilet starts 9:30 morning hours for 2-3 hours depending upon visibility of crocodiles. Guest should reach by 9:00 morning at Daujee ferry location. Only one trip is organized in a day but Yes, if 15-20 more guests are present another trip can be arranged. Snacks/Drinks are provided as refreshment during tour and narration during tour is given by Jake himself. It is always good to talk one day in advance via mobile phone or personal visit specially if you touring Old Goa. How many crocodiles one can watch in a day’s trip? – I question. It depends. 10 years back I saw 38 crocodiles in a single day. Watching crocodile is a guarantee – said Jake. Not only crocodile one can also watch different types of birds such as Heron, Grey Heron, Purple Heron, Egret, Little Egret, Great Egret, Sandpiper, Kingfisher etc. etc. And a brochure describing his job. Rs. 1200 per person for the trip but if you want a special trip then Rs. 15,000 – The cost. Thank you â€“ said I. Tour will start only from 21/22 October, 2010 and continue till end of April. Ok. Will visit for sure. And he showed his land full of back-waters. Jake â€“ How you decide where your lands end? And we both had a laugh. It was time to cross the Cambarjua canal. Ferry was on the other side. After few minutes it was within our side i.e., St. Estevam village. Thankyou Jake for saving next long ride. 5-7 minutes journey and I on the other side i.e., Daujee, Old Goa. Shortest very shortest, isnâ€™t it. Thanks to Jake for the guidance. Will visit again for sure once tour starts â€“ said I. Reach Gandhi circle, Old Goa and ask for Daujee ferry â€“ Thatâ€™s it. Cross via jetty to reach St. Estevam village where Jake lives.